Hannah O’Flynn (#34) is defended by Haley Johnson (#11). 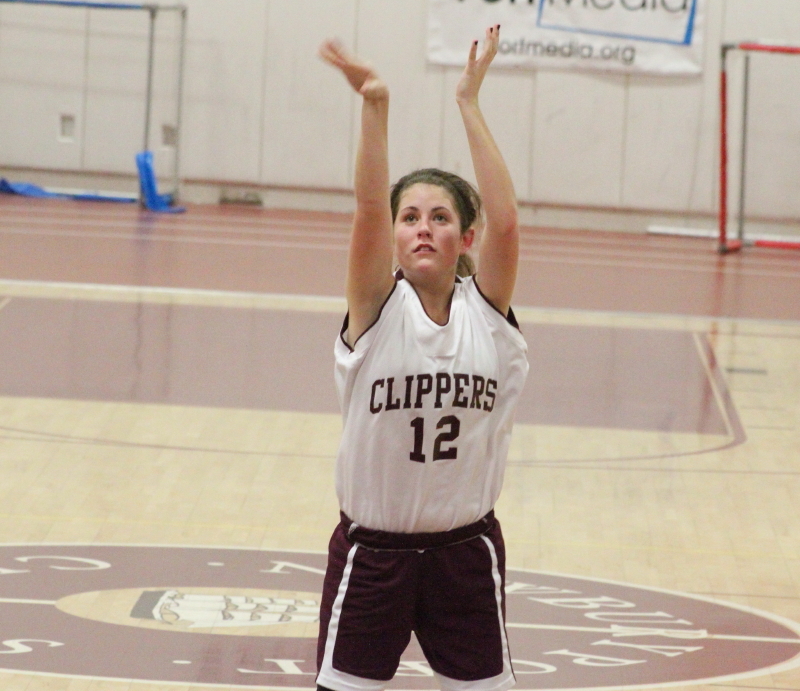 Molly Rowe (18 points) led all scorers and made 8-of-9 free throws. 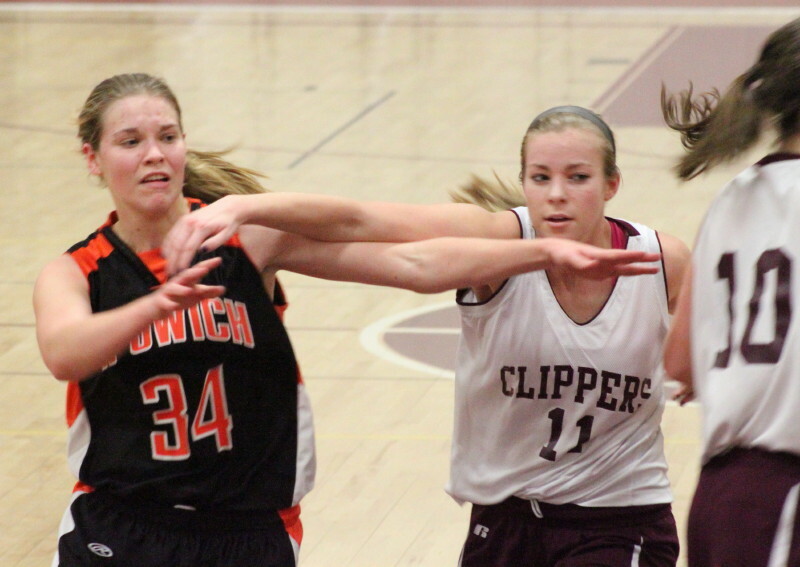 (Newburyport) The Clippers got scoring from Molly Rowe (18) and Beth Castantini (15) and solid defense from Haley Johnson (on Hannah O’Flynn) and defeated Ipswich, 52-39, on Friday night. The Clippers (7-7) earlier had beaten Ipswich (9-3) at Triton’s tournament in December. The Tigers had won six straight since then. This was a game that Newburyport led from start (first seven points) to finish. The Tigers made their run late in the 3rd quarter by making three straight long ones (two by Nyra Constant and one by Hannah O’Flynn) to close to, 30-28, with 1:50 left. 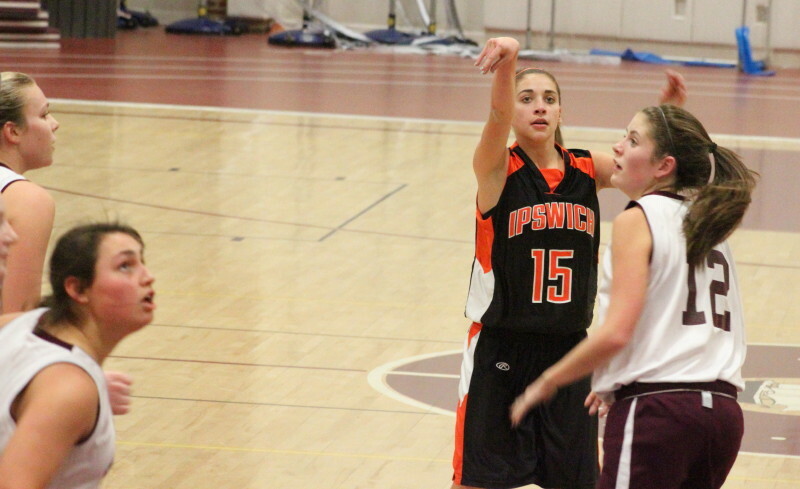 The rest of the quarter Ipswich didn’t score a point while Newburyport ran seven straight points. The killer basket was a last second three from sophomore Lea Tomasz which gave the Clippers a, 37-28, advantage at the end of the quarter. The Tigers were reduced to firing long range and fouling the rest of the game but on this night that strategy didn‘t work. Turnovers were plentiful (43) as both teams played tight defense and denied passing lanes. Despite the tight defense, Newburyport’s better organized offensive schemes turned up more high percentage shots. Eight of the Clipper’s sixteen baskets were from in close. On the other hand, Ipswich had only four layups out of their fifteen baskets. Hannah O’Flynn recorded sixteen points for Ipswich but seven of them came in the final quarter after the outcome was decided. Credit Haley Johnson. She, with an occasional helping hand from a teammate or two, kept Hannah on the perimeter most of the time. A Clipper strength this season has been their foul shooting. In this game they were 17-for-22 despite missing their last three attempts. Beth Castantini was five-for-six while Molly Rowe was eight-for-nine. Those numbers certainly explain why both players frequently take the ball to the basket hoping at least to draw foul shots. Nyra Constant (#15) launches a long one over Molly Rowe. Nyra Constant connected on three long ones for Ipswich. Julia Davis hurt her wrist during a collision. Plenty of action during inbound plays. When Ipswich took the ball out under the basket they were shooting at, there was enough pushing and shoving by both teams to give almost every player a foul. 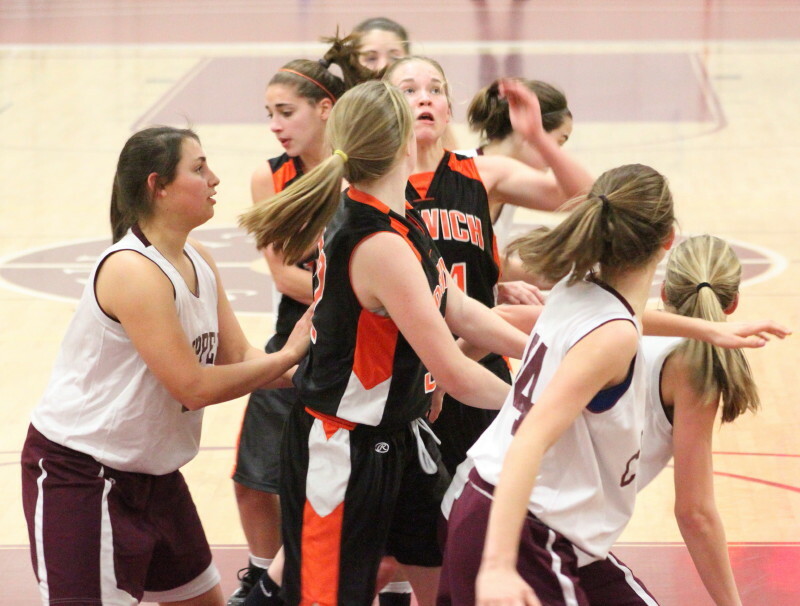 The Tigers wanted to get Hannah the ball in close and Newburyport refused to allow it. 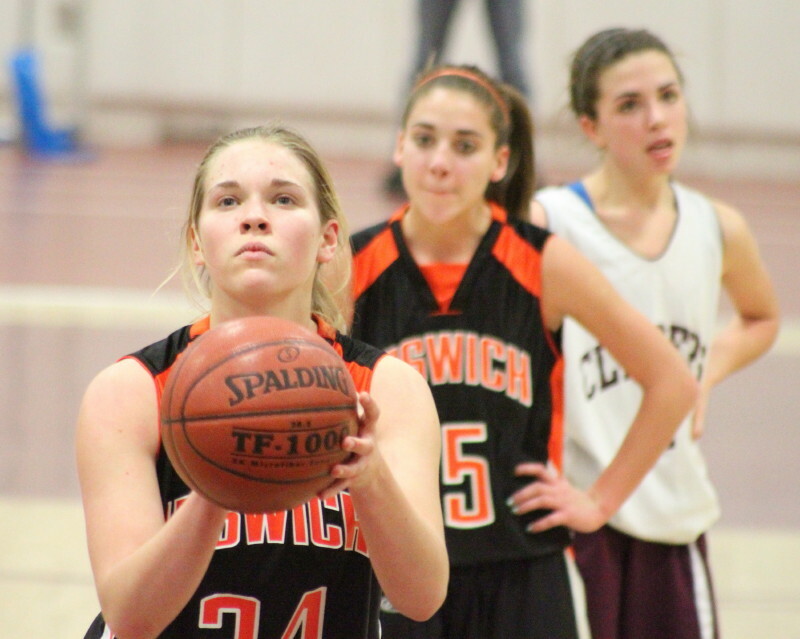 Hannah lines up a free throw. Hannah was 4-for-9 from the foul line.